This weekend is tax weekend in the U.S. Have you paid yours yet? Maybe you got a refund...maybe you had to pay. Either way, if you're short on cash...the Stuff to Scrap (STS) Color Challenge is a great way to get free digi-stuff. Here was the color palette chosen for April. Head over to the STS forum for more freebies. You can grab my contribution here or clicking on the image below. It's a super cute addition! I love the word arts! Thank you! This is really sooooo pretty! Thank you! Thank you so much for this post. 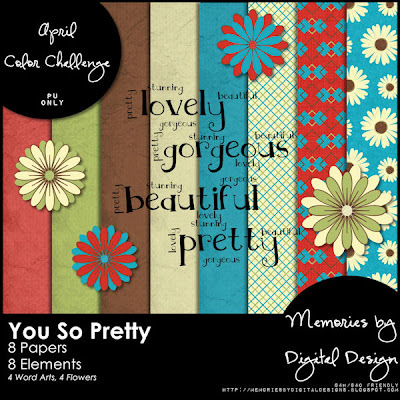 I want to let you know that I posted a link to your blog in CBH Digital Scrapbooking Freebies, under the Page 7 post on Apr. 17, 2011. Thanks again. Many thanks for sharing your fantastic kit!